About a week ago, Sarah Fernandez from the TLC Network's blog, Parentables, contacted me. I am so flattered to be included in her article about using Mason jars and wanted to share with all of you! Sarah also has a wonderful blog, Chateau and Bungalow. 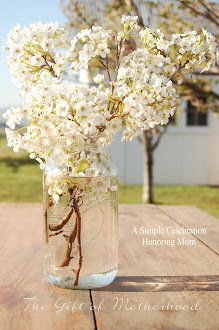 If you would like to read the article with some great ideas on how to use Mason jars, click HERE. There are some really fun and unique ways to use them around the house! To view the tutorial on how to make a Mason jar soap dispenser, click HERE. Thank you Sarah for including me in your wonderful article! wOW! so cool Julia, what a compliment that is. Congrats girl! Congratulations, Jill! That's quite an honor! I am so much in love with those mason jars and their lids....we do not have similar ones in Italy! Wonderful news Julie! Prasie the Lord that He is blessing all of your efforts! congrats Julia, we are so happy to have one of your special soap jars! It has been such a blessing, great Job! I love this idea and the tutorial was great. I use jars in my kitchen for storage containers.